HUNTSVILLE, AL -- Gen. Dennis L. Via, Army Materiel Command commander, today announced the establishment of two Army Awards -- one for leadership and another for innovation -- at the AUSA Global Force Symposium and Exposition. The awards honor two distinguished Soldiers, Lt. Gen. (R) Arthur J. Gregg and the late Maj. Gen. Harold "Harry" J. Greene, for the standards of excellence that they set in leadership and innovation. "Today's recognition of Lt. Gen. Arthur J. Gregg and the late Maj. Gen. Harold Greene, presented to his wife, Dr. Susan Myers, was a fitting tribute to two leaders who blazed trails in Army logistics, and research and development," said Gen. Via. "These awards will forever bear their names, and serve to remember and honor their lasting contributions and legacy." Recipient of the inaugural Lt. Gen. Arthur J. Gregg Sustainment Leadership Award is its namesake Lt. Gen. (R) Gregg, one of the Army's great logistics leaders of the 20th century. Lt. Gen. Gregg started as a private in 1946, and moved up the ranks to become a three-star general, retiring in 1981 as the Army's Deputy Chief of Staff for Logistics. He commanded a supply and services Battalion in Vietnam, commanded an Army depot, and directed logistics for the Joint Chiefs of Staff. Throughout his career, he improved supply performance, enhanced readiness, and better equipped Army warfighters. Lt. Gen. Gregg also overcame adversity during the socially turbulent times of the 1950s and 1960s. He stood out as an unpretentious, selfless leader with an inspiring work ethic. "My philosophy on leadership is very simple and straight forward," he said. "I think a leader must always put the mission first and himself or herself last." Future Gregg Awards will recognize Soldiers or civilians whose leadership is credited with making significant and measureable contributions by improving operating efficiencies, readiness levels, or demonstrating fiscal responsibility. 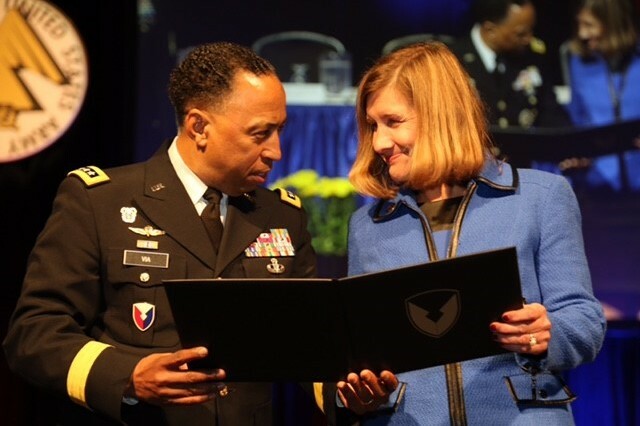 Dr. Susan Myers, wife of Maj. Gen. Greene, was on hand for the announcement of the creation of the new Maj. Gen. Harold "Harry" J. Greene Award for Innovation, and was presented an honorary award commemorating its establishment. Maj. Gen. Greene, a 34-year Army veteran, was killed in 2014 in Afghanistan, while serving as the Deputy Commanding General of the Combined Security Transition Command -- Afghanistan. Following years of service in the engineering field, from Athens, Greece, to Istanbul, Turkey, he rose to become Deputy Commanding General of the U.S. Army Research, Development and Engineering Command at Aberdeen Proving Ground, Maryland, and the Commanding General of Natick Soldier Systems Center, Natick, Massachusetts. During his tenure at both organizations, he advocated for the incorporation of cutting-edge technologies -- from smartphones to video games --- into Soldier training. 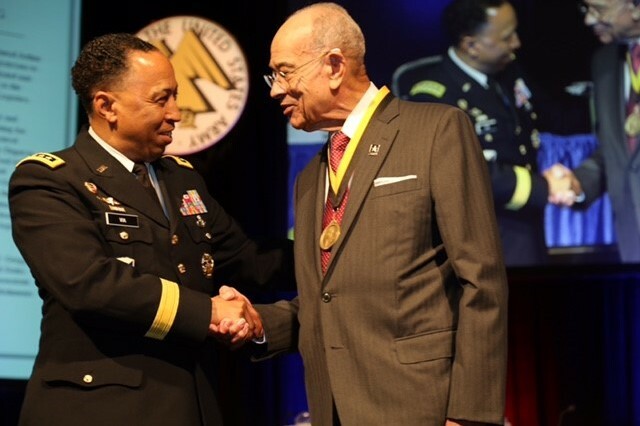 His success in the Army's research and development organizations was a foundation for his leadership as program executive officer for intelligence, electronic warfare and sensors in the Office of the Assistant Secretary of the Army (Acquisition, Logistics, and Technology). Future Greene Awards will recognize Soldiers and civilians who contribute to Army science, technology, research, and development, and whose efforts foster innovation and excellence throughout the materiel enterprise.